Tammy Tarbell-Boehning was born on the Akwesasne Reservation but grew up living between Onondaga tribal land and the city of Syracuse; this juxtaposition between two worlds reflects her complex identity. Tammy struggled with this duality, and artistic expression became a way to retain her Mohawk heritage. She attended art school, first training at Onondaga Community College. After transferring to Syracuse University as a sculpture major, Tammy became interested in using clay to express herself as a Native woman (Iroquois Indian Museum 1996). Some might find her techniques “inauthentic” because she learned them in art school instead of on the reservation, but Tammy exercises her authority as an innovator and a woman reclaiming her heritage. Unlike the makers of ancient Haudenosaunee pottery, Tammy threw this pot on a wheel and fired it in an electric kiln. The design, probably painted in clay slip, was inspired by decoration on pottery shards collected in the Schoharie Valley. To finish the pot, she polished it with a smooth stone (Mike Tarbell 2010). 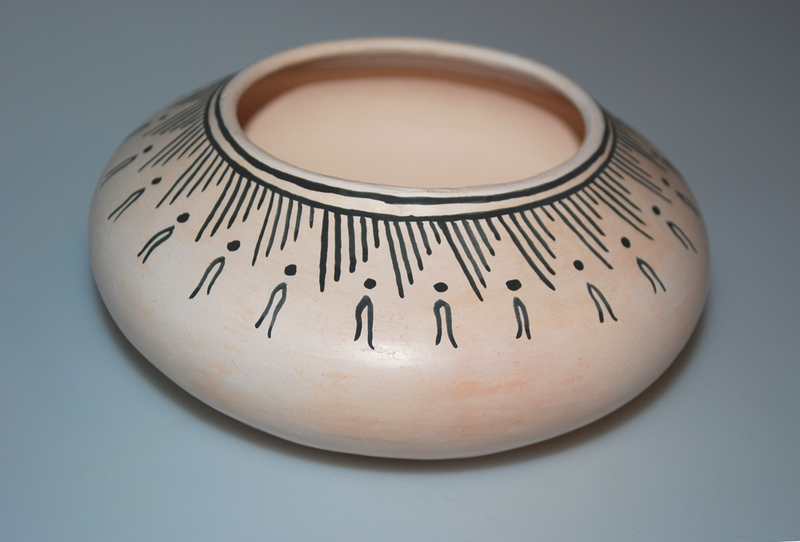 The designs are typical of ancient Iroquois pottery decorated with geometric patterns on the rim such as the parallel lines outlining the lip and major and secondary motifs below. The Haudenosaunee stopped making pottery when trade goods from Europe become available; in time, the pottery tradition was lost, and so were the meanings of symbols.